Laser cutting is currently the most popular method of sheet metal cutting due to its absence of setup and tooling requirements. Using a focused beam that is measured less than .010 inches in diameter, virtually all metals can be cut with little to no burr on the finished piece. Without the tooling limitations found in traditional punching methods, lasers are capable of cutting holes as small as .012 inches and can create any profile imaginable. Despite all of the advantages that come with using a CO2 laser, there are some drawbacks. Highly reflective materials such as aluminum, copper, and brass can be difficult to cut and may be better suited for punching or waterjetting. Also, high volume parts that have primitive shapes are still better suited for traditional punching methods as the capital costs of laser cutting are higher. 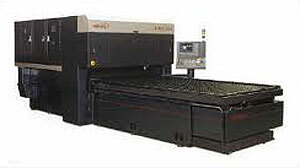 Below is a list of Fabwest MFG's Laser cutting capability. Punching is often the cheapest method for creating holes in sheet metal in medium to high production volumes. Special shaped punches and dies are used to blank a large variety of parts that can be created from most metals and some plastics. Using up to 33 tons of force, any shape can be pushed through the work piece within one second, leaving a sheared edge that is commercially acceptable for just about any industry. Though CNC punching is the preferred method of cutting for medium to high production volumes, it is less cost effective for prototyping, smaller runs, and parts that contain complicated profiles or inner contours. If your parts require runs that do not exceed a quantity of 100, laser cutting or waterjetting may be a more economically feasible solution. 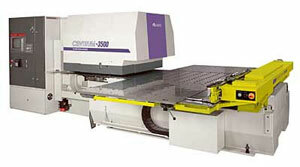 Below is a list of Fabwest MFG's CNC punching capability. Waterjet cutting is an excellent cutting alternative that perfectly compliments any fabrication facility. Using 60k PSI of water pressure, waterjets can cut nearly any material up to 18'' thick with virtually no setup. 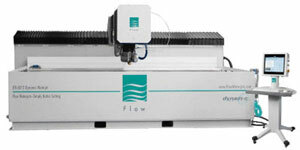 Waterjets can cut plastics, rubbers, glass, wood, exotic metals, and leave little burr . If parts require material that is sensitive to high temperatures, waterjets can avoid creating heat affected zones (HAZ) that are generated from laser and plasma cutting. Though waterjets are very versatile machines, they do have drawbacks that make one of the other cutting methods a better choice. Waterjetting is a much slower cutting process and does not have the repeat-ability tolerance that other cutting methods do. Capital costs are also typically higher than other cutting methods due to garnet and consumable parts. Despite its drawbacks, waterjetting is perfect for smaller runs and exotic materials. Below is a list of Fabwest MFG's waterjet cutting capability. Usually Closer than 0.010" Usually Closer Than 0.005"